I think it’s high time that I added a bit of color to my dining room and summer is the perfect time to do so! I kept this room on the neutral side for Christmas and the winter, but now I’m ready to brighten things up a bit. I already use touches of blue in other parts of my home, so it was the perfect color for me to bring into the dining room too. Plus, blue reminds me of my favorite place to be in the summer – the beach! I was totally inspired by these beachy salad plates that I ran across. The colors of the stripes remind me of the sand on the beach and all of the shades of blue in the ocean. The plates can be purchased HERE. I used them as part of an easy breezy summer tablescape. The gray and white checked napkins are actually tea towels that I found on clearance at a local shop a couple of years ago, but THESE are very similar. I also used the striped salad plates in the baskets below the hanging lanterns. I am so in love with the blue in this room and I think that all of the greenery brings the room to life! Dried hydrangeas and a couple of other blue accents are all that was needed on the opposite side of the room. I found these global inspired pillows at a local store. They have the most wonderful nubbiness and texture! Similar pillows can be found HERE. 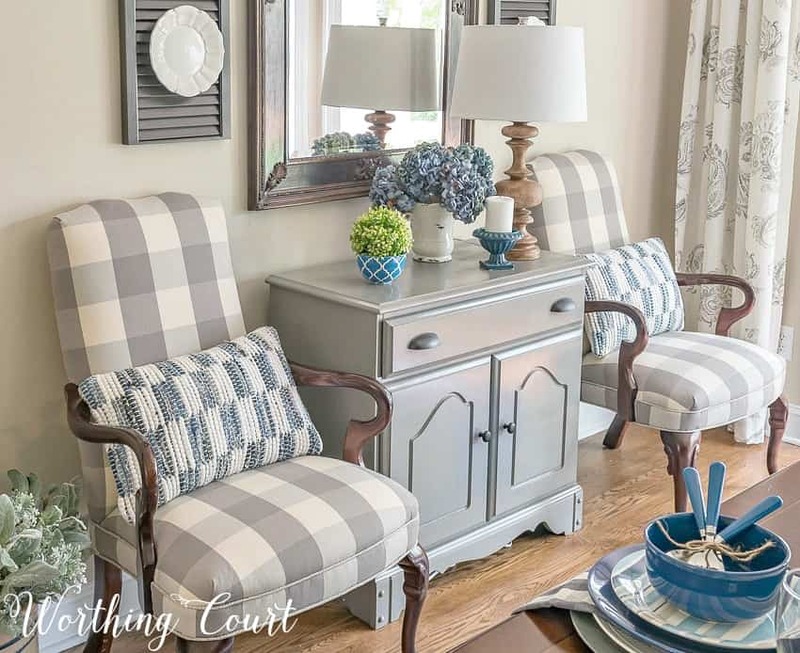 They aren’t the sort of thing that I would normally place against the buffalo check fabric, but I love the totally different look they give the chairs. I’m always fascinated by mirror reflections, so I’ll close with my very favorite shot of the entire room. « Super Easy Patriotic Banner – No Sewing! 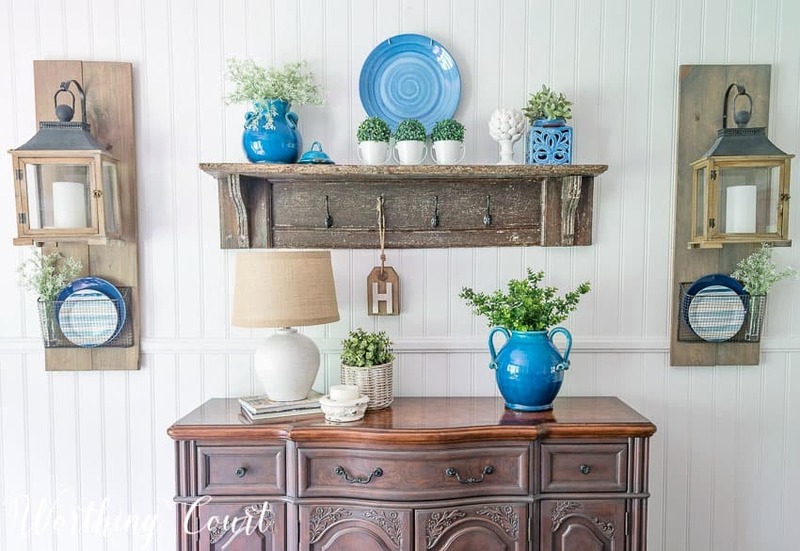 I love the blue touches you have added, and the greenery just seems to make everything pop! Your diningroom is lovely. I also like blue. 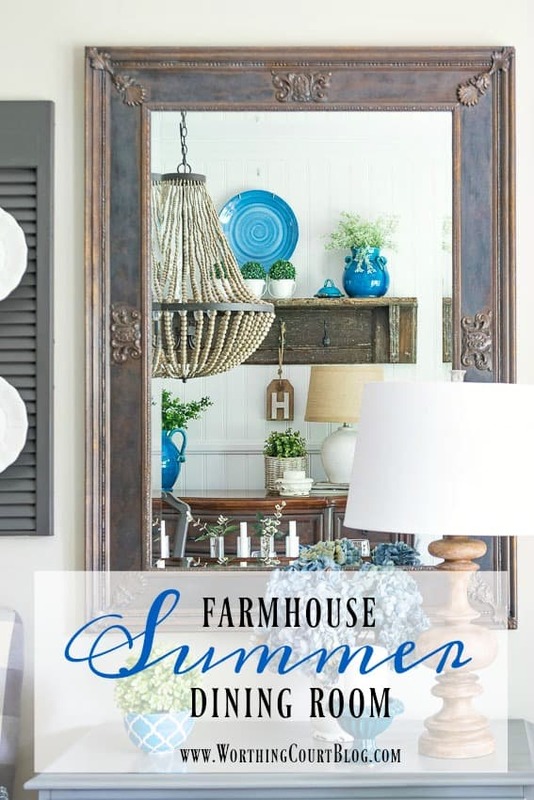 I want to get started at bringing summer into my home. Thanks for the great ideas. 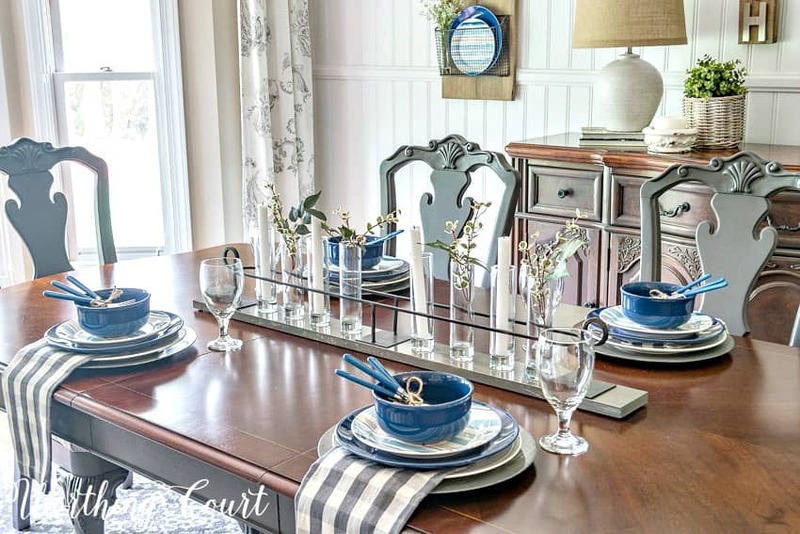 Blue is my favorite color, and it’s beautiful in your dining room! Love that blue! It looks great. Have a fabulous day. I love your dining room! Your mirror shot looks like it belongs in a magazine and the mirror itself is gorgeous!! I love the blues with the grey. Love the blue!! Your home is beautiful. Your dining room looks great with the blue accents and the greenery. Blue reminds me of the beach also, a place I love. Love the shade of blue you you choose…. It’s gorgeous. Love the touches of blue. Did you use sticky tack on the bottom of the tapers to get them to stay? Love this idea. Hi Lauren. I fully expected to have to use some sticky tack, but when I put the candles in the vases they stood up by themselves. 😀 If you look closely though, you can see that one of them started leaning mid-photography and I didn’t notice. I simply adore the blue and greens you have decorated with! Perfection!! Love the blue. Looks perfect. Thanks for inspiration. LOVE the nubby pillows on the buffalo check chairs!! Very inspiring!! I LOVE beachy colors — alternating blue and white (porcelain pieces) with more teal-tones when I switch from winter to summer. Pairing blues with gray is a little unexpected, but looks fabulous! LOVE the pops of blue!!! Have a great weekend, Suzy! Kudos on the change. I would have never thought those pillows could go with the chairs but they look great. 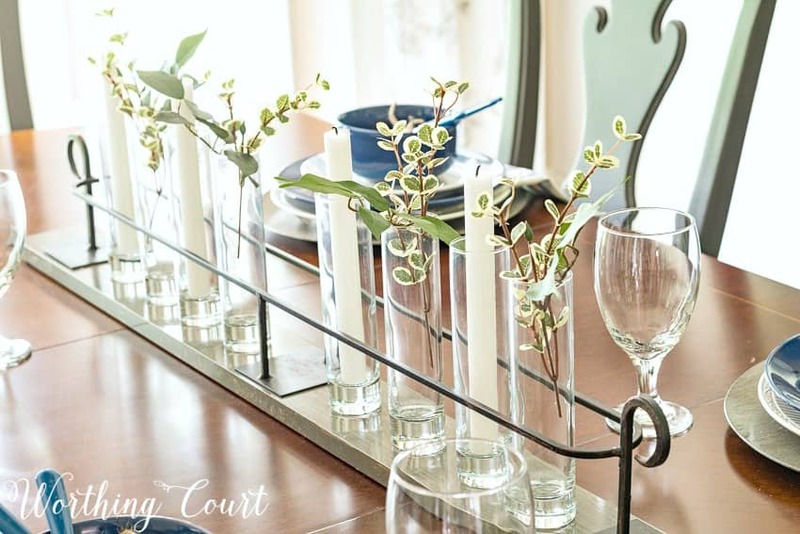 I especially LOVE the oh so simple but PERFECT centerpiece. You are inspiring! Lovely accents with the blue and green. Color really lives large in a neutral room. What is there NOT to love? Everything looks beautiful. 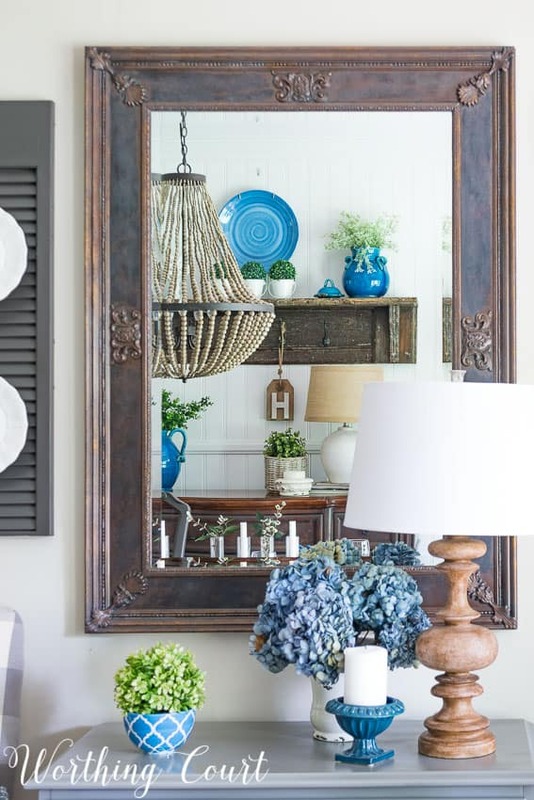 LOVE the detailing on your large mirror! Love the blue and green together! 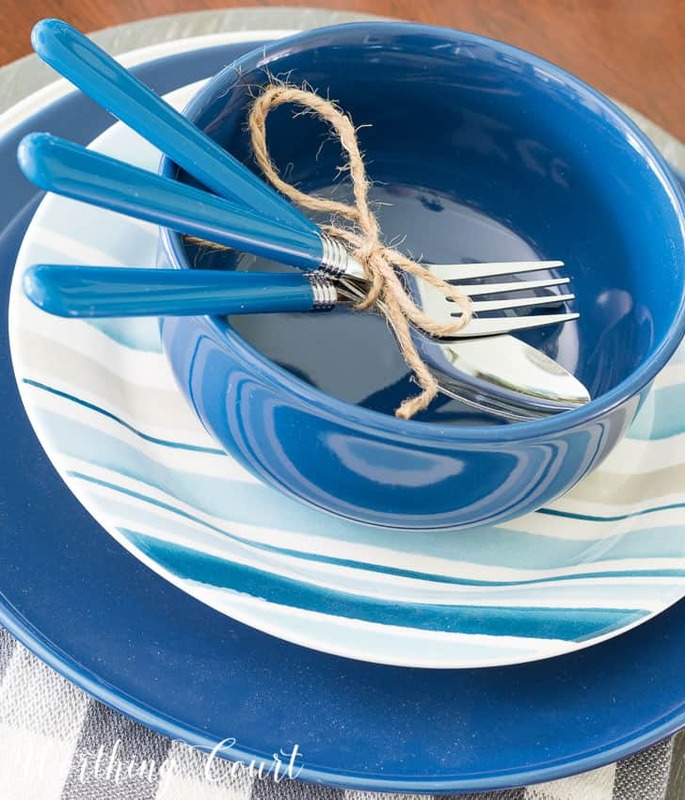 Blue is one of my favorites, so I love your summer blue tablescape! I am pulling out all of my red, white and blue and reading your patriotic post! Thanks for all the lovely ideas! Love your style! Absolutely classy and fun. 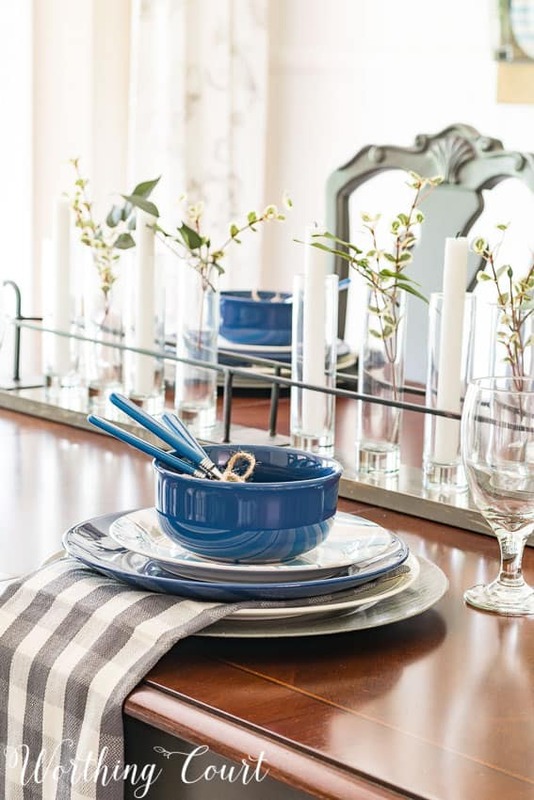 Wow, the simple change to blue accents gives your dining room a really fresh new feel. love the beachy look – my kitty cat would be playing with the candles -I tack all of mine since she came along. I put away the bunnies last week and kind of went for a similar look to carry through until the last of June. Very refreshing …..love the blue touches!! Such a gorgeous blue! Where did you get the flatware? It’s adorable. Thank you, Rhonda! I found the flatware at HomeGoods with their outdoor dinnerware. How amazing the blue color transformed the look of the room, it’s lovely. Great colors! Thank you for sharing! The blue is so pretty. The whole room is beautiful and it looks like Spring. The blue is stunning. Bringing in that one color can change the entire appearance. You always wow me every time. I’m really starting to like blue in the decor! 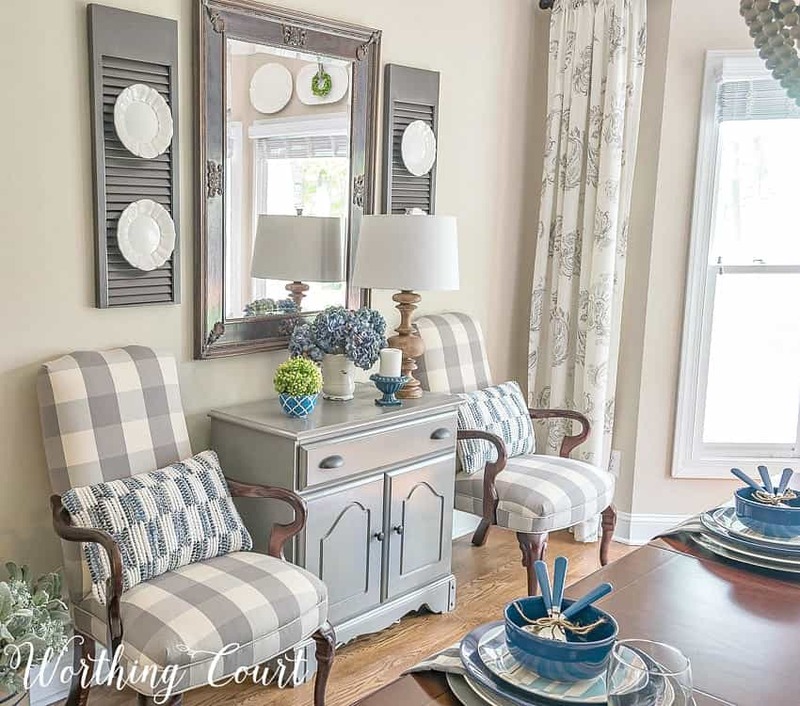 Love the blue touches … they compliment the grays in your dining room just perfectly. Blue is my favorite color so I enjoyed seeing the touches. Where did you get the candle / flower centerpiece, ? love it. Hi Eileen. The candle centerpiece is one that I put together using an old wood scrap that I painted to look like driftwood, a metal piece that I found at a thrift store and simple glass vases. Super easy! Love the blue accents. It looks great! Just wait everyday to see if I have an email from Worthing Court . my way so to speak.Just settling for “same ole same ole “and that makes me sad.? remodeling my parent’s 60+ year old house. Again thank you so much from one North Carolinian to another. I think I’ve been writing this to everyone. Blue and white are the perfect summer colors. I love the pillows you bought. they do look beautiful. Have a great day. That shade of blue–bordering on turquoise–is so bright and cheerful! I love what you’ve done with the dishes and other pieces of decor. And I absolutely love that chunky, wood-look lamp on the dresser between the two chairs. It all looks lovely! Wonderful blue color! Very Springy!Looks fabulous as always. Your dining room looks just wonderful. I have a serious crush on the beachy blue color ! Your room looks fantastic. I love blue as well. It’s funny, I haven’t always… I am in love with that mirror. I’m visiting from the Wow Me Wed. link up. Thanks for sharing. 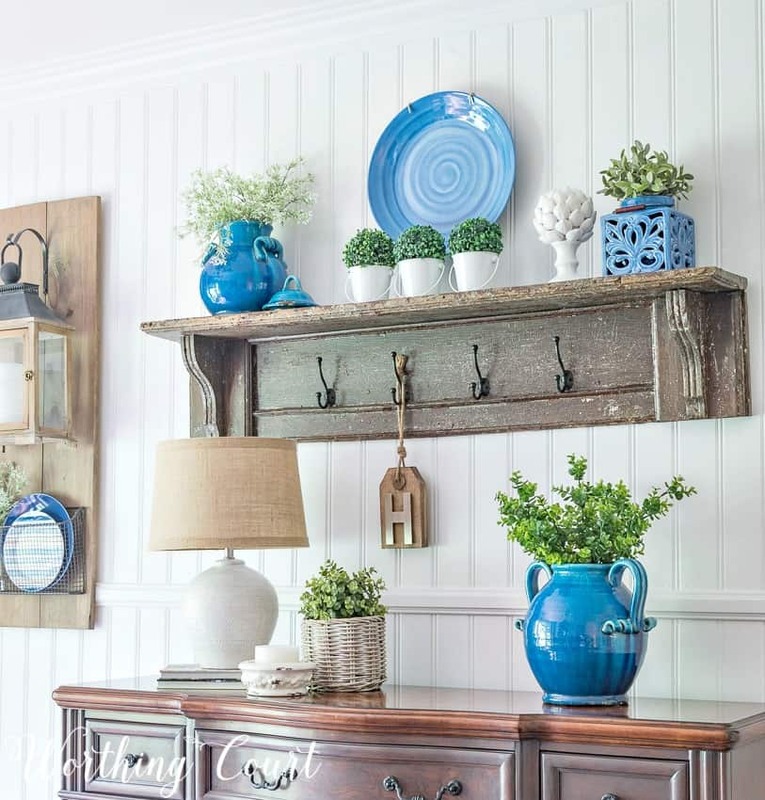 I love all the touches of blue! It is the perfect touch for summer. Pinning! Love your dining room. The blue you added, is such a pretty shade and it adds a great accent to the gray tones. Absolutely beautiful dining room! I love your centerpiece and am amazed you made it! Suzy, Love everything you do. You are my favorite blogger. Hi Pat. That shelf is actually the mantel from an old fireplace surround that I found at a thrift shop for $10! We cut the sides off of it and I touched up the places where we made the cuts with some stain and then added the hooks. The paint was really chippy, so I also sealed the whole piece with some poly to prevent more of it from chipping off.